We're republishing this post, originally written in 2014, because back-to-school, return-to-reality season is upon us. Think you don't have time to plan ahead? Here are ten lunches you can pack in less than five minutes. This one goes out to all you busy bees who claim you don't have time to pack yourselves lunch. So you turn to delivery, or the deli across the street, or a frozen meal you'll try to revive in the office microwave, all in the name of saving time. But wait! There are a whole bunch of lunches that you can pack at night, or even bleary-eyed in the morning, in just five minutes or less. Which is about the amount of time you spent chatting with Lisa about TPS reports this morning, or listening to Man in the Mirror, so don't tell me you can't deal. 1. Avocado toast. It will never get old, and we'll never stop eating it. 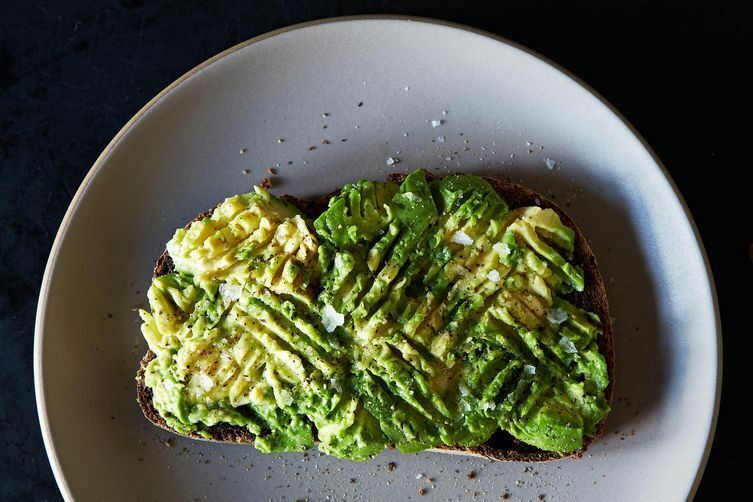 Bring in some bread, an avocado, and your salt stash, and you're good. 2. 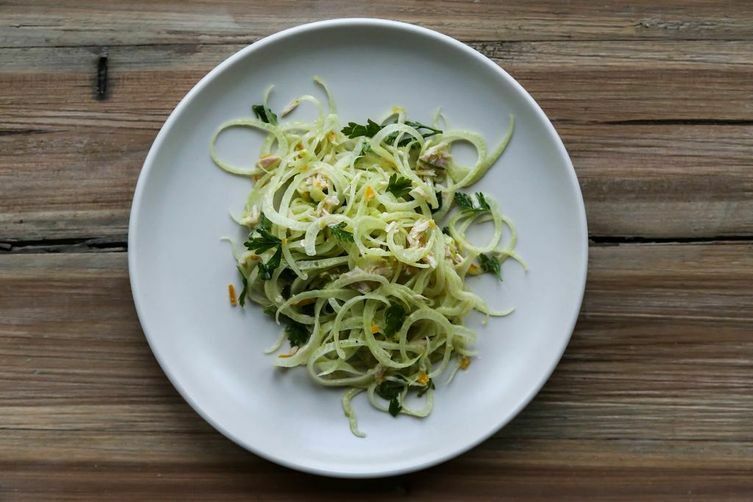 A shaved vegetable salad—it holds up well, even on the second day. Try sturdy vegetables like fennel, celery, and radishes, then toss them with herbs and dressing. Then add a protein, like tinned fish. Kenzi also likes this carrot salad from Orangette. 3. Almond butter upgrade: Add chopped nuts, dried fruit, chia seeds, sweetener, or spice to that little tub of almond butter you were planning on eating atop toast for lunch. More: Extra points if you make your own nut butter. 4. 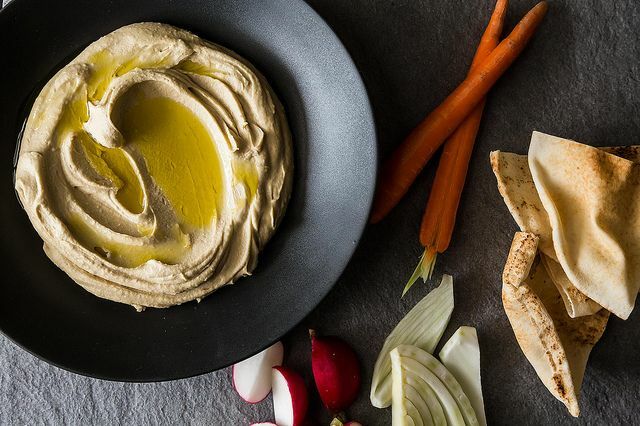 Hummus, pita, and sliced vegetables. Yes, a snack can be a lunch, if you pack enough of it. Especially when your hummus is homemade. 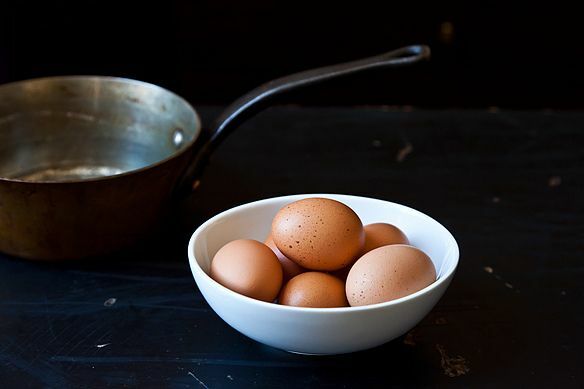 More: Here's how we like to boil our eggs. 6. Cheese and fruit sandwiches. Think cheddar and chutney, manchego and fig spread, or a soft, creamy cheese and strawberry jam. 7. Taco night leftovers. 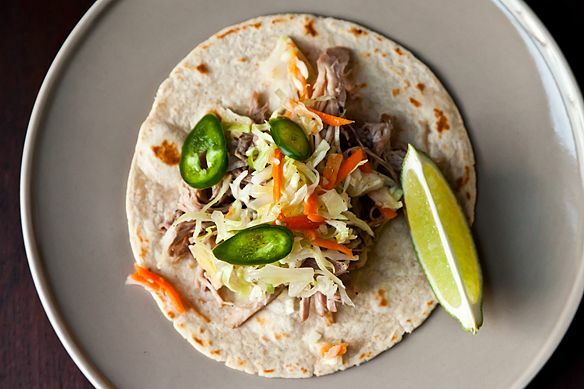 Make yourself a little picnic out of tortillas, shredded vegetables, cheese, and meat. Have a fiesta in your cubicle. Tequila not recommended. 8. Merrill tops baked sweet potatoes with last night's leftover pasta sauce. Bake the potato while dinner is cooking, or just bake it in the microwave once you get to the office. Poke it with a fork a few times before you nuke it, lest your office experience a lunchtime explosion. 9. Pack up a hodgepodge of grains, plus beans or lentils, and sturdy vegetables (cooked or raw), next to a jar of your favorite dressing. 10. Congratulations! You've now made yourself lunch, in the same amount of time it took you to read an article about making lunch. 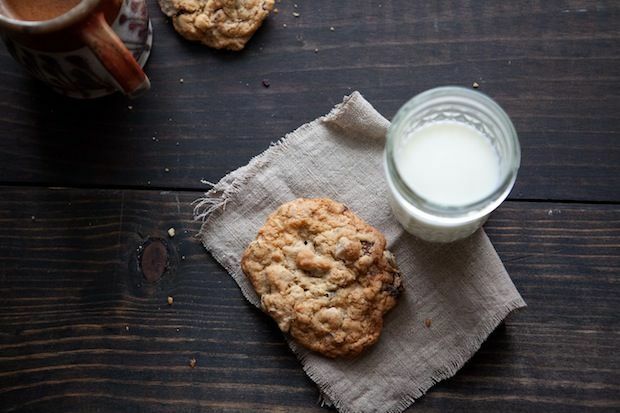 Just make sure to pack yourself a cookie, too. Tell us: What are your favorite 5-minute lunches? Vegan. Grains, Greens and veg. spiced up with citrus/ginger/spicey dressings. Big bowls that hold up to pre-assembly. Wraps of more of the same with crunchy carrot, snap peas, cabbage and greens, more spicy sauces including creative uses and flavors with cashew 'creams'. I start with salad as a base and then add whatever is on hand, usually left overs. Today was Asian meatballs, salad and cold spaghetti with a vinaigrette dressing & a dash of satay sauce. Tomorrow, egg salad with satay sauce, instant Gado Gado. Thanks for the tips on the boiled eggs. I constantly amaze my coworkers with my.... imaginative lunches. Many a time you will find me with a can of hearts of palm (yep straight out the can), a pouch of tuna or salmon (again, straight from the pouch), and a cucumber or bell pepper, raw. Sometimes I will have an apple or banana during the day at some point and always oatmeal for breakfast. Either overnight oats or plain oatmeal in the micro at work that I stir ground flax and nut butter into (makes it taste like a warm pb cookie!!). When I DO pack my lunch, it's usually a garden salad (loaded...kale, spinach, celery raddish, romaine, carrots, sprouts, chick peas etc etc etc). I love to bring one piece of fresh fruit and set it on my desk. I enjoy the color and shape all morning. Can't wait to eat it for lunch. Grab this from your fruit bowl or crisper in 3 seconds as you're running out the door in the morning. I've been packing lunch for husband and me for about a year. Agreed, the key is Sunday prep and pack during dinner cleanup. A typical routine: Sunday cook a grain; bake chicken breast for husband (I'm a veggie) and make chicken salad; pre-wash salad greens and pre-slice salad goodies; sauté onion, mushroom and spinach; boil eggs. Along with fruit and plain yogurt or pre-made oats we have breakfast and lunch-healthy and yummy! Not so much work when you consider savings in weeknight time, calories, and health. Thanks for some new tips! Leftovers. I love left over dinner for lunch or even breakfast, come to that. meat, fish, whatever, and if I don't refrigerate it, it is room temp by lunchtime. I know you will call the salmonella police on me, but really, it's fine. I take no chances. No really hot temps and it is not unrefrigerated that long. This looks tasty easy and fits the budget. Did I say healthy, too! I pack lunch as I clean up from dinner. Today was 1/2 filet of trout, rice pilaf and sweetcorn cut off the cob. Delish! Fried chickpeas. Heat 1/4 cup olive oil in a pan at medium heat. Add one can chickpeas (after rinsing them). Cook for 3-4 minutes. Remove from heat, place in container, add spice mix such as garam marsala to taste. The best. I have it at least once a week. 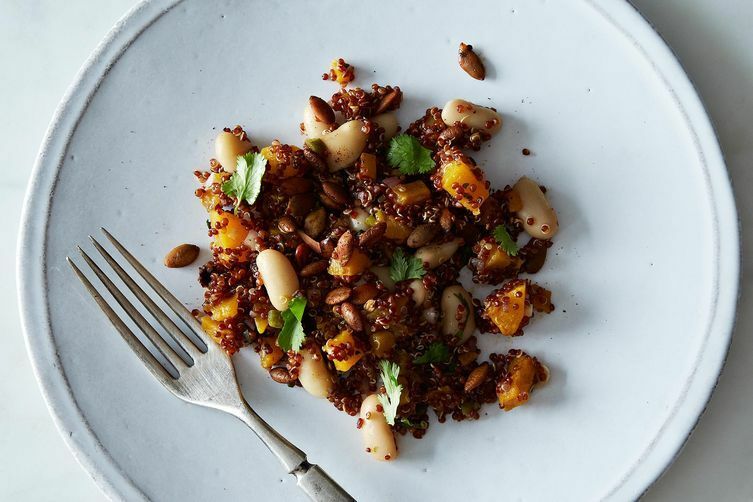 Editor's note: "Nine Lunches That Pack in Nine Minutes (or Fewer)"
If you put your lunch together as you are putting your leftovers away after dinner all you have to do is grab and go. In the morning. Those lunches I've made many times, so easy especially if you prepare the night before. Heathier than those store bought garbage. You never know what they put into them or how they've been prepared. And how lazy can you be? Ugh. Seriously, all of this looks horrible. Agreed. I'll be picking up a $7 sandwich across the street, thanks. Some weeks are crazy and all I can manage is to bring my groceries to work. I head to the market on Sunday or even Monday morning and grab a container of pre-washed greens, bell peppers, mushrooms, assorted olives, pickles, artichokes, etc. from the olive bar, a hunk of sparkly gouda, a cup or so of sliced almonds from the bulk bin, maybe some bean salad if anything looks decent at the deli counter, and some eggs. If I'm lucky, I'll boil five eggs on Sunday night, put them in a container, add that to the sack with all those other groceries, and take them all to work. I assemble a salad from my ingredients each day in the kitchen at work. No advance prep necessary! (This works best if you have a a cutting board and a decent knife at work.) I always keep oil, vinegar, and sea salt at the office, so dressing is easy. And if you don't have time to boil eggs, grab some smoked salmon or fancy creminelli sausage and, voila! Healthy lunch on the fly. A note on nuking the sweet potato at work: I recommend cutting it on halves or quarters at home before you pack it, then it won't take as long in the microwave. I usually put the potato in alone, covered with a damp paper towel to avoid it drying out, for about 3 minutes or until tender. Then top with chili or sauce and heat for another 1-2 minutes. I forgot to add: heat the onions in the barbecue sauce just until warmed.